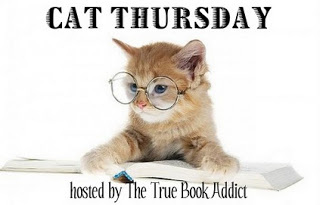 Musings of a Bookish Kitty: Cat Thursday: Happy Birthday, Parker! Parker was just a little kitten when I first met him. He was living in the parking lot of the courthouse where I worked at the time. He was very people friendly, often seeking out attention. I wasn't looking for a cat to bring home. I already had a dog, and I'd never really been a cat person. A persistent coworker put the pressure on though, and I eventually gave in. Parker didn't immediately come to our house. I took him first to the vet where he spent the night after being neutered and given a general well check up. The next day, April 18, 2002, Parker came home for the first time. We celebrate the day as his birthday (even though he was probably about 6 to 8 months old at the time). It didn't take long for my husband and I to fall in love with Parker. He settled into our family quite well. He and Riley became bosom buddies that first day. Parker is sweet and even tempered. He can be playful and vocal when he wants to be. He is bold and is rarely shy around strangers. He is a nurturer. 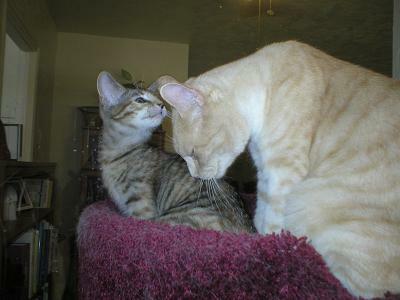 He comforts Mouse when she is upset and has been a good mentor to Anya. Parker is my little angel. What a sweet baby! I truly believe that we do not choose our pets, our pets choose us. That is why I have six cats!!! haha They just show up and tell us they are staying, so please get them their shots and feed them please. Happy Birthday little kitty! Sandy - Parker definitely chose me. He's to blame for my love of cats. I still love dogs, of course, but cats have earned a place in my heart too. Aw, what a sweet kitty! I'm glad he found a home with you! Kathy - I am too! We are so lucky to have him. He's been such a blessing in our lives. Ah, I'm so in love with Parker. Adorable, he really is too cute. What a great story! And what's what adorable pictures! Lovely story, Wendy and happy birthday to a very special cat! Glad he gets on with the dog, too, that can be a difficult situation. Charlie - Thank you! Parker adores my dog Riley. Both my cats do, actually. We'd been so worried when we first brought Parker home, but the two took to each other pretty quickly. 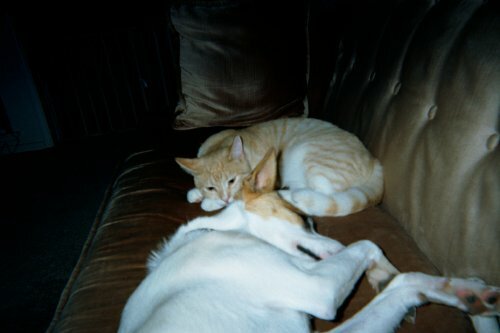 When we brought our second cat into the mix, my dog adapted to her faster than Parker did. I loved your story about Parker and it surely seems as though he's shoiwn his thanks by blending in so well with your family; sweet photos Wendy. 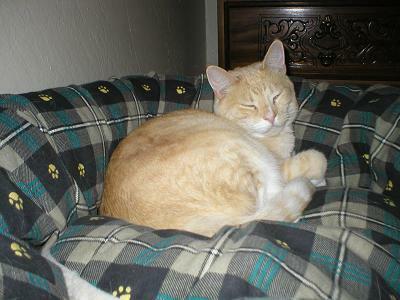 Diane - He is the sweetest cat I've ever known. :-) Thank you. I just got chosen by a sweet little kitty too, and I now just how you feel about Parker. She is the sweetest and most loving little thing, and I am so glad that we found her. Happy Birthday, Parker! Have a big bowl of milk and a tummy scratch! Aww these pictures are adorable. 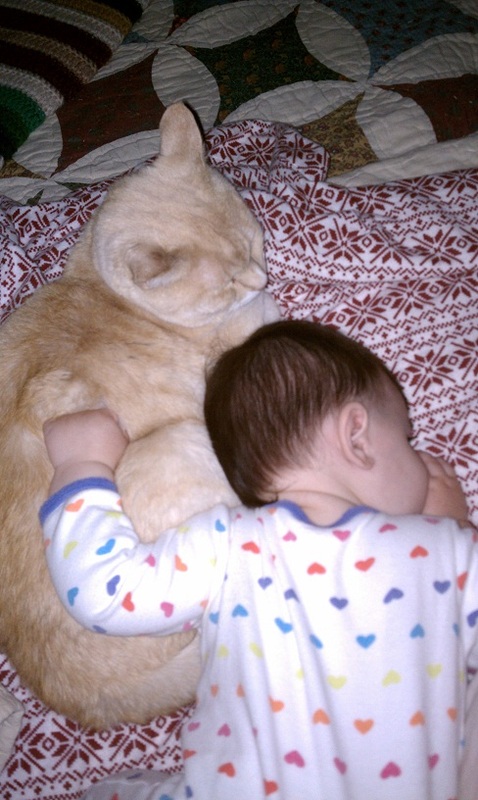 I love the baby and kitty sharing some love. Happy Birthday Parker. He is lucky you rescued him, he looks really happy now. What a sweet story! Thank you for sharing all of those adorable pictures and Happy Birthday to Parker. Happy B-Day to Parker! Love the pictures! Stacy - It melts my heart too. They are so precious together. Ah, that picture of Parker and Mouse is adorable! Happy Birthday Parker. You are a real cutie pie!